Click on the image to see a larger image! 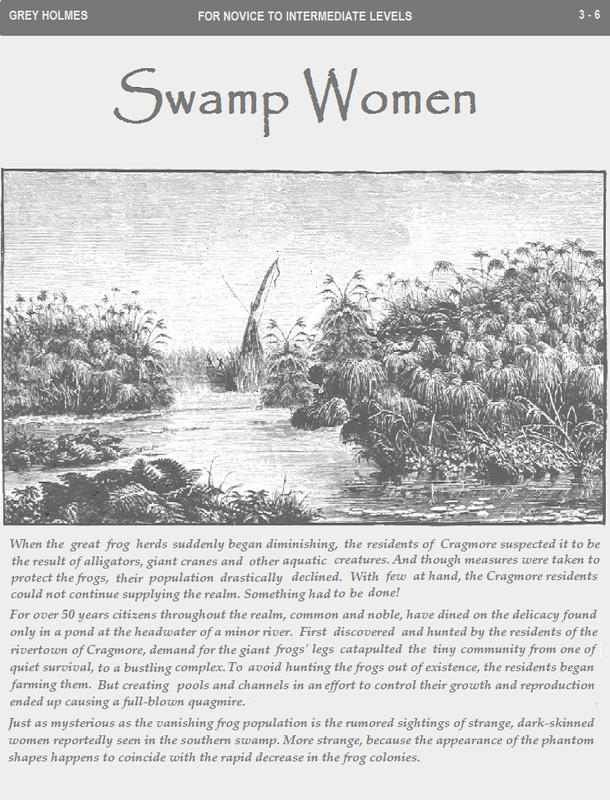 I was lucky enough to get a copy of this (Swamp Women) from Mr Pinnell to take a look at and offer feedback to him and now I am writing my review of the adventure having read all the way through it many times. I have reffed and played OD&D since the early fall of 1975. I will warn you that this is the first review I have attempted and I am trying to not give too much away so I may be light on the details some of you might like to see. This scenario is intended to be run using the Holmes Basic D&D rules with the OD&D Greyhawk supplement. However, author also gives suggestions as to how to run the game under other Classic D&D rule-sets or their clones. Additional rules info that may be needed, depending on the rule-set you choose to use are found in the Appendices. Recommendations for the makeup of the adventuring party are also provided. The background given is quite intriguing pitting a riverside community and its economic future against a matriarchal tribal society. A band of tribeswomen are on a religious vision quest unbeknownst to the villagers and that is what is creating the economic woes of the community. 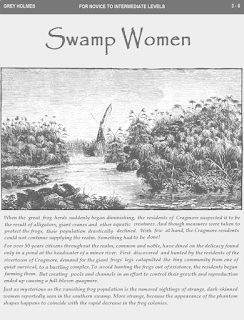 A bit a getting started advice is given and then a bit more background of the community of Cragmore along with brief details of three major NPCs. Then a section of Gossip and Rumors is provided which is in my opinion, both highly entertaining and highly useful for the DM to provide the players with a lot of information which may or may not be entirely true. Again some very useful advice is given to the DM in how to use this information. While there is a "plot" and "mission" there is room for a number of encounters within the map that are unrelated to either, which in my mind is a bonus.The various areas are well-described and their are excellent maps provided (and it would be easy to extend the main map if desired. The map is well indexed and several random encounter tables are provided. DMing advice is given in a number of location and in my mind is good sound advice. I would suggest that a DM using this adventure should use some 3 x 5 note cards to make some salient notes for quick access during the game. In my opinion, this would be a very good adventure for a less experienced DM to run since a lot of general how to advice is given on using the adventure and that it lends itself to different levels of complexity in the ways it can be played. While it is designed for a lot of roleplaying, it can be run in other styles. If you are a starting a campaign and are going to combine homebrew with materials from other people, this would be a good way to get things started. To include the maximum possible number of products both free and for sale, in all possible languages so that it theese lists will be of the maximum possible use to the maximum number of people. If you would like to write a brief and concise informative statement about each item that would also be good. And it would be great if you identify the language you are posting in. My deepest appreciation to anyone and everyone who contributes. Bobbery-pack - A pack of hounds of different breeds, or oftener of no breed at all, wherewith young officers hunt jackals or the like; presumably so called from the noise and disturbance (known as a bobbery) that such a pack are apt to raise. May-dew - The dew collected off the grass with sponges, used as a cosmetic. As late as the 1930's Scottish girls gathered May-dew at dawn during the month of May and partook of its beautifying virtues. Joggs - On the outside of the church, strongly fixed to the wall, are the joggs. These were made use of, when the weekly market and the annual fair stood, to confine and punish those who had broken the peace, or used too much freedom with the property of others. The stocks were used for the feet and the joggs for the neck of the offender, in which he was confined at least during the time of the fair. Album nigrum - The excrement of mice and rats, formerly used both externally and internally as a remedy, but now very properly abandoned. Fence-month - The month during which, in England, hunting in any forest is prohibited. A month in which it is unlawful to hunt in the forest because in that month the female deers fawn; it begins fifteen days before Midsummer. Snollygoster - A shrewd, unprincipled person, particularly a politician. Twitter-light - formerly used instead of twilight. Zafty- A person very easily imposed upon or taken advantage of. Interlard - To put lard or fat between layers of meat. Metaphorically, to mix what is the solid part of the discourse with fulsome and irrelevant matter. Thus we say, "to interlard with oaths, compliments," etc. Hemicrania lunatica - Pain in the head arising from changes in the moon. Fulhams - Loaded dice are called high- and lowmen, or high and low fulhams, by Ben Jonson and other writers of his time, either because they were made at Fulham [between Kensington and the Thames, in London], or from that place being the resort of sharpers.